Researchers and postgraduate students have presented their ideas about how maritime law and policy should be shaped in the future. The 4th annual conference was held at City University London on the 12th April 2013. 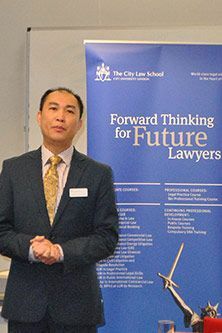 It was organised by the London Universities Maritime Law and Policy Research Group (LUMLP), which is based at City. Topics covered included the threat of terrorism, smuggling and piracy to the cruise ship industry; the effect of the expiration of antitrust guidelines and the compensation mechanisms available to victims of oil pollution damage caused by offshore facilities. The conference is designed to provide a supportive environment for researchers and postgraduate students to present their work. Submissions in all areas of law and policy, including relevant interdisciplinary work, are welcome. Each speaker has fifteen minutes to present their research ideas, followed by a ten minute discussion. "The conference brings together researchers from various parts of Europe to share their research findings. It is the only maritime law conference of its kind in Europe and indeed, the world. Cutting edge research is shared. This is the fourth year for the conference and we are gratified to see it grow from strength to strength." Three postgraduates from City University London submitted their research at the event. Carlo Corcione presented a paper about the protection of agents and contractors involved in shipping operations. Often individuals such as terminal operators, stevedores or freight agents rely on contracts between the shipper and shipowner for protection from liability. His research considers the legal problems with extending the contractual protection to those individuals who are not parties to the contract. The research of PhD candidate Dimitrios Arvanitis is entitled: 'The legal status of offshore oil and gas installations in international law: Are they 'ships'?'. His thesis examines marine pollution originating from offshore oil and gas installations and asks whether the regulations on ship pollution would apply to these installations. Julia Constantino Chagas Lessa's research focuses on the 'abandonment of seafarer'. Her presentation explored whether or not abandonment constituted a breach of the seafarer's employment contract. Julia questioned the sort of protection available for seafarers kidnapped by pirates given that a clause covering such an eventuality is unlikely to exist in their employment contract. The sessions were chaired by Professor Lars-Göran Malmberg, expert in Public Law and Transportation Law at the University of Gothenburg in Sweden; Dr Minghua Zhao, a Marine Sociologist, at the Greenwich Maritime Institute; Susan Hawker a Principal Lecturer in International Trade and Shipping Law at London Metropolitan University and Professor Chris Bellamy, Director of the Greenwich Maritime Institute at the University of Greenwich. Further details about the work of the London Universities Maritime Law and Policy Research Group (LUMLP) can be found on The City Law School website.